Subduction zones are associated with the largest earthquakes in history, sometimes referred to as megathrust events. To quantify just how big these earthquakes are, seismologists use the “moment magnitude” because it is especially useful for very large earthquakes. It prescribes the relationship between the area of the fault rupture, the average displacement, and the strength of the rocks that broke. One might imagine that an earthquake with a large area and more movement that broke through strong rocks would have a much larger moment magnitude than an event along a small area with a small amount of movement that occurred in weak rocks. Thus, subduction zones boundaries, which are long as well as deep, have the potential to produce the largest earthquakes, magnitudes 8.0 and greater. Research has shown that subduction zone boundaries rarely rupture over the entire length of the fault, but instead seem to be broken into segments. The length of a rupture controls the magnitude of the earthquake, and understanding howand where this segmentation might occur is critical for subduction zone earthquake hazard assessment. The Cascadia subduction zone is a convergent plate boundary where three small oceanic plates – the Gorda, Juan de Fuca and Explorer plates – subduct beneath the North American continental plate off the west coast of northern California, Oregon, Washington and southern British Columbia (Figure 1). To examine the segmentation of this region, Bodmer et al. (2018) used seismic tomography, which is an imaging method analogous to CT scans that we usually associate with neurology (brain medicine). In both instances, there is an energy source (x-rays or earthquakes) and a receiver (an x-ray detector or a seismometer) that records the wave properties of this energy after it passes through something (a person’s head or the earth). Armed with this unique dataset, they found two distinct, localized low-velocity anomalies beneath the subducting plate (Figure 2). These anomalies are interpreted to be regions where the Earth’s mantle is rising, generating partial melt and possibly having higher temperatures. Because of this, the authors believe these regions beneath the subducting plate are more buoyant than elsewhere, thus affecting the behavior of the subducting slab itself. 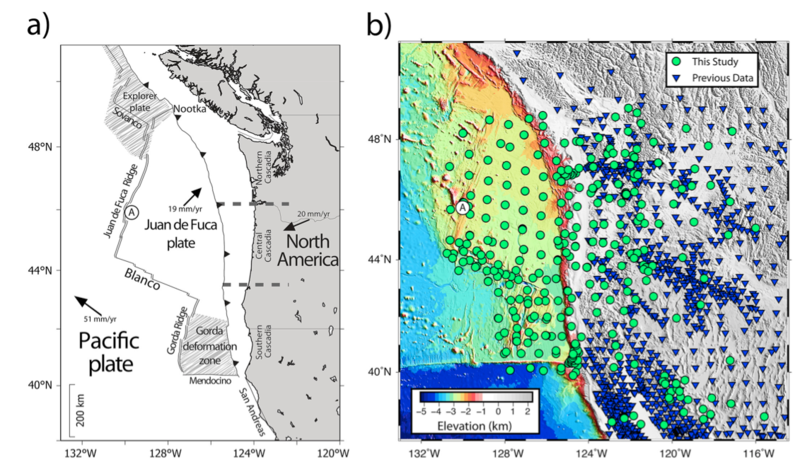 These authors attribute the low-velocity anomaly beneath southern Cascadia (northern California), to melt generated by mantle rising upward from underneath the subducted slab (Figure 2e), and moving NW toward the Gorda deformation zone (Figure 1). They suggest this upwelling is the result interactions between the Gorda, Juan de Fuca and Pacific plates. In the case of the northern low-velocity anomaly, beneath northern Cascadia (Northern Washington/Olympic Peninsula), the authors consider nearby hotspots to be the most likely potential source for the buoyant mantle (Figure 2c). Interestingly, these low-velocity zones also correlate with areas where the plates are more strongly coupled, and where greater seismic tremor occurs. Bodmer provides a highly simplified analogy to help visualize what might be happening. Imagine two balloons filled with Helium (the two buoyant low-velocity zones) trapped beneath a blanket (the subducting slab). He says, “the balloons may be able to change the shape of the blanket, analogous to changing the dip of the downgoing slab, and/or the balloons may change the forces on the topside of the blanket if it is in contact with anything above it, akin to plate coupling.” In these ways, the low-velocity anomalies could affect the relationship between the plates in the subduction zone, and indeed, there is a strong correlation between their location and measures of both plate coupling and certain types of seismicity. Thus, these low-velocity anomalies may well influence where segmentation of the plate boundary occurs, which in turn is related to the location and magnitude of megathrust earthquakes. Such observations could inform researchers working on other megathrust boundaries, improving our understanding of where subduction zone earthquakes might occur and why. Imaging studies at other subduction zones will likely require similar levels of onshore-offshore data coverage in order to image such anomalies in their full geophysical context. Figure 1. (Above) Maps showing the Cascadia region. (a) Map showing the different plates and the segment location boundaries (dashed lines). Arrows represent absolute plate motions. Shaded areas represent the Gorda and Explorer diffuse plate boundaries. (b) Digital elevation map of the area. Green circles are Cascadia Initiative and coincidently operating stations processed for this study. Blue triangles show the location of seismic stations and data from previous studies, which were also incorporated into this work. Figure 2. Tomography results showing high- and low-velocity anomalies. High-velocity anomalies are shaded blue, and low-velocity anomalies are in red. (a) Map view at 100-km depth showing north-south trending high-velocity anomaly around 122°W, inferred to be the subducting slab. (b) Map view at 150-km depth. The localized low-velocity anomalies are circled in red. Green lines indicate locations of vertical cross sections shown in (c)-(e). The colored dots along the green lines are for points of reference in the cross sections. (c) Vertical section through Axial Seamount and the northern low-velocity anomaly. Black arrows show inferred mantle flow. (d) Vertical section through central Cascadia. (e) Vertical section through the southern low-velocity anomaly and Gorda deformation zone, with black arrows showing inferred mantle flow.